Congratulations for getting started with Tailwind Tribes! We are SO so excited that you've joined the great community of like minded bloggers and small businesses. 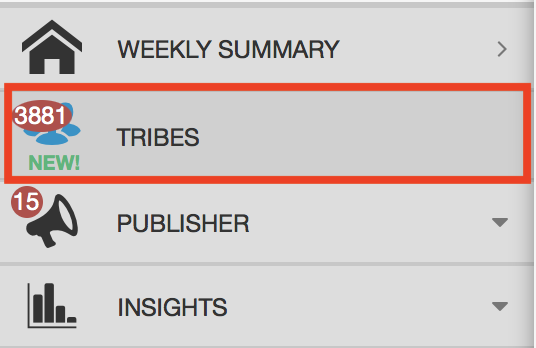 As you continue to grow with Tribes, and watch your Pinterest grow alongside- it might be time to join more Tribes or submit more content than the free version has to offer. Tribes will ALWAYS have a free version you can use (even if you are on the Plus Plan), but if you need more beyond that- look no further than adding a Tribe PowerUp to your existing Plus subscription. Make sure your Pinterest Profile is subscribed to either the Monthly or Annual Plus Plan! 2. At the top right corner of the Tribes page there will be a counter to show how many Tribes you belong to and how many submissions you've submitted that month. By hovering over the red highlighted area, the bar graphs help you keep track of usage according to your plan limit and let you know when you are close to the final submission (and then you can no longer contribute). 3. Click the "See Tribes PowerUps" green button to see all the available PowerUps. Annual Plus Subscriptions will see pricing for PowerUps paid yearly per profile (that automatically renews). The Annual PowerUps will limit based on the date you upgraded to Plus (i.e. if you upgraded on the 15th of May, then the submissions count will reset on the 15th of every month). The Tribe Pro Powerup is $59.88 per year/per profile in addition to the Annual Plus Subscription of $119.88 per year per profile (which is like getting it for $4.99 per month)! Of all the PowerUps, this is our lowest priced with the biggest savings. The cost with both the Plus Plan and Pro PowerUp paying Annually that would be a total cost per year of $179.76 USD ($119.88 + $59.88). If you have two Pinterest profiles on Plus and add a PowerUp to both, that would be $179.76x2 per year. Monthly Plus Subscriptions will see pricing for PowerUps paid monthly per profile (that automatically renews). The Monthly PowerUps will limit based on the date you upgraded to Plus (i.e. if you upgraded on the 15th of the month, then the submissions count will reset on the 15th of every month). The Tribes Pro PowerUp will be an additional $7.49 per month per profile to the $14.99 per month per profile Plus Subscription for a total of $22.48 USD per month. If you have two Pinterest profiles on Plus and add a PowerUp to both, that would be $22.48 x 2 per month. Helpful Tip: If you are currently subscribed to the Monthly Plus plan, you'll have the opportunity to switch to Annual to access the extra savings! Remember, when you add a PowerUp in the middle of a subscription it will be pro-rated. Such as, your billing date is on the 15th of every month, and then you add the Tribes Pro PowerUp on the 1st. That means there will only be a charge for 15 (on average) days worth of service, roughly $4 on the 1st, and then the full price of both on the 15th of the month. Helpful Tip: PowerUps only limit the amount of Tribes you belong to, and submissions, but does NOT limit how much you can share FROM a Tribe. Your Plus Plan will dictate how many pins you can share and schedule from a Tribe.